Hitachi pneumatic power tools are in high demand in professional circles and enjoy a very high reputation for their quality and durability. Visit any job site in your neighborhood you will definitely find more than one Hitachi nailer in use. 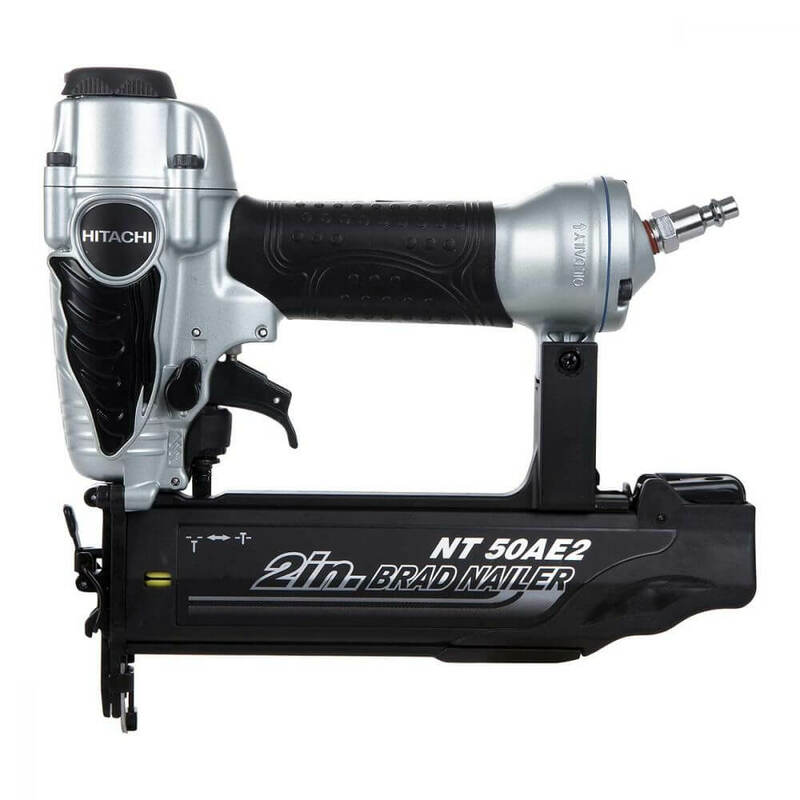 If you are planning to start small carpentry project or doing some small repair in your household with a brad nailer, Hitachi NT50AE2 18-Gauge 5/8-Inch to 2-Inch Brad Nailer should be in the top 3 choice list for brad nailer you want to buy. Don’t just be fooled by our word, Let’s find out why. Hitachi NT50AE2 is an excellent choice for 18-Gauge 5/8-Inch to 2-Inch Brad Nailer to complete any small carpentry jobs without any hassle. 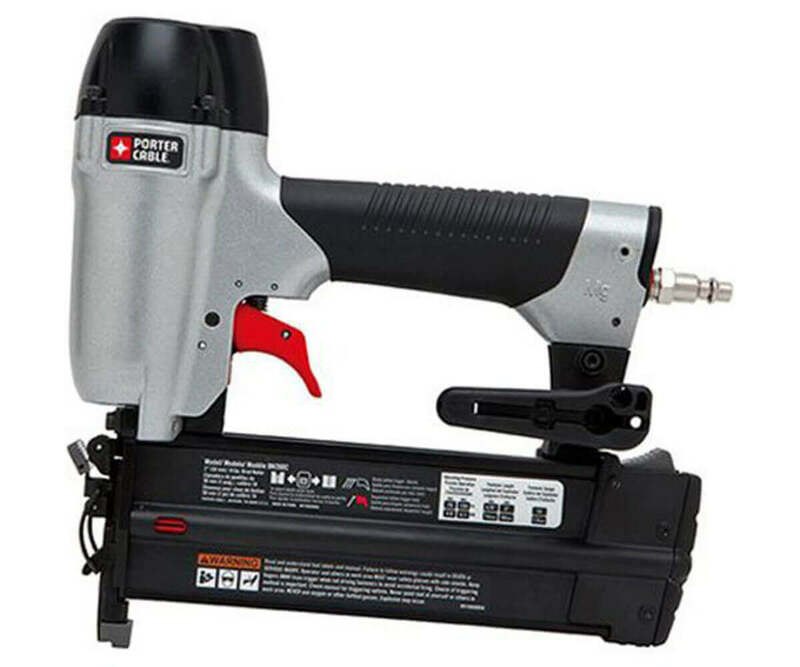 This nailer exactly delivers what DIYer or professionals expect in a brad nailer, first finish small woodworking project on time, secondly get elegant and beautiful looking pieces like many other craftsmen. Hitachi NT50AE2 can do both and more. 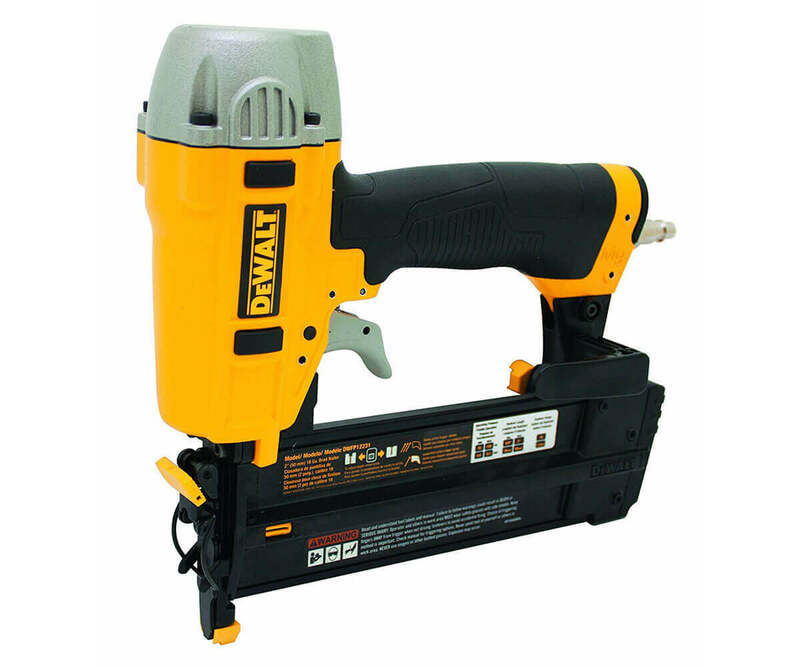 This pneumatic powered high capacity nailer is suitable for small furniture, cabinets, crafts, picture frames and many smaller woodworking jobs. Before going any further we must admit, we wanted to discover what customers are saying about Hitachi NT50AE2. As its been in the market for a while and already made an impression among its users. 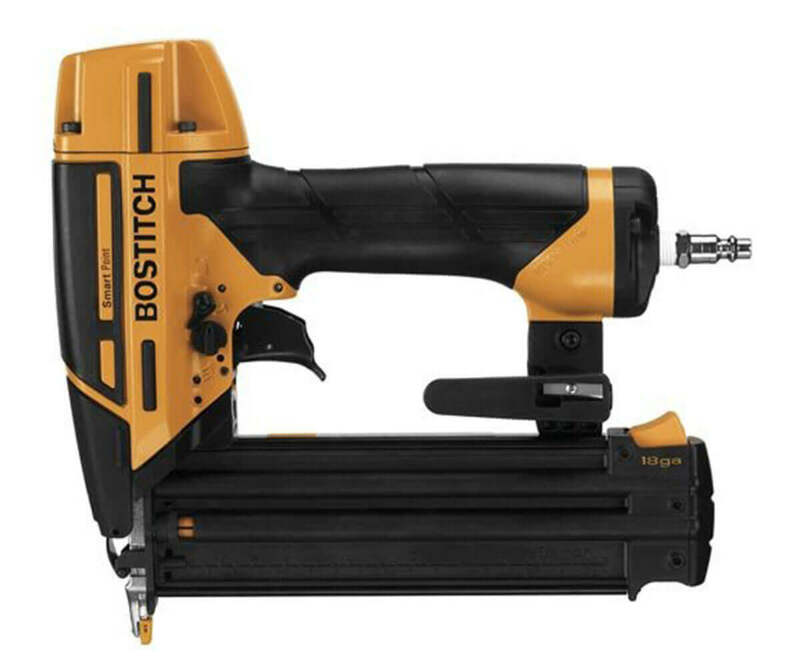 Our research suggests this tool is getting solid ratings from the user and not only that it’s one of the least expensive brad nailer on the market considering its quality and the brand it represents. Now let’s get deeper and see what it is hiding under the skin. First thing you will notice about this Hitachi NT50AE2 Brad Nailer is lightweight, more accurately just 2.2 pounds. Hitachi build it with aluminum core to reduce weight but make it durable. Also, elastomer grip ensures the comfortability, precision, and efficiency. The magazine holds 100 nails from 5/8″ to 2″ in length and requires 70-120 PSI operating pressure to function properly. This nailer also provides easy and quick nail jam extraction without the help of any additional tools. A yellow indicator (See the picture) in the composite magazine window let you know when you are getting low on nails. However, its placement where dry fire lockout normally found prevents your ability to stop damaging workpiece from dry fire. Apart from that, you will find Hitachi added 360 degree adjustable exhaust port to direct the exhaust away from you. 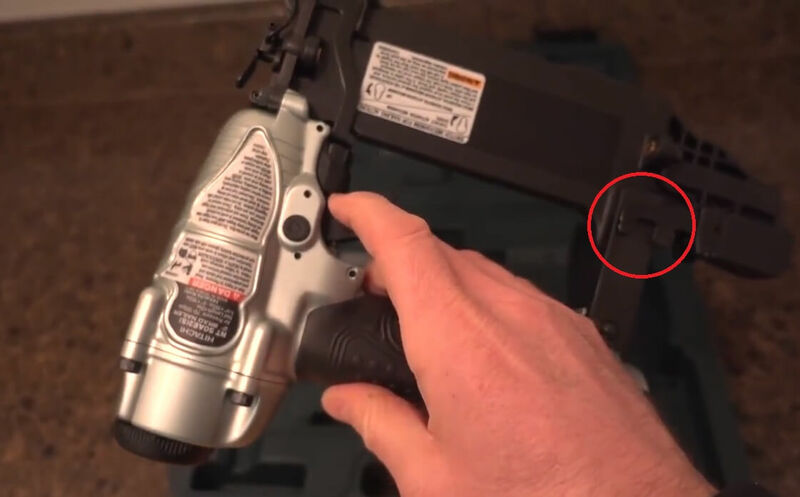 It really has almost everything to be considered as best brad nailer with one minor design error worth mentioning is non-swivel fixed air inlet. Without swivel air inlet you will not be able to move freely with the nailer. However, you must consider other key feature it has to get the full picture. Hitachi NT50AE2 comes with the selective actuation mechanism for making tool-less firing transitions. This brad nailer saves you from constantly adjusting the nailer and can be used for a variety of different application simply sliding the selection control up or down by your hand. You can select between continuous or intermittent firing. Continuous nailing is suitable for the task needs to be complete fast that doesn’t require much precision, while the intermittent firing is ideal for jobs that require a high level of accuracy. Another feature of Hitachi NT50AE2 is a convenient depth-of-drive adjustment knob located near the nose. Just turn the knob halfway to do quick, exact modification to driving depth without any additional tools. Hitachi NT50AE2 comes with bottom loading magazine that’s designed to load 5/8-2 inch brad nails quick and easy with head size ranging from 0.075 to 1.9. The magazine loading capacity is 100 brad nails depends on the nail size. So, it significantly reduces the frequency of loading and reloading. A visible indicator allows you to know how many nails are remaining. Hitachi NT50AE2 body built with lightweight aluminium, and weight is just 2.2 pounds. The length, height and width measure 10 x 9-3/16 x 2-3/8 inches. So, it makes the nailer not only light in weight but also make it easy to maneuver. Also, the soft Elastomer grip gives the optimum control and extended comfort for a day-long job. As you already know from our previous discussion that Hitachi NT50AE2 2-Inch 18-Gauge Brad Nailer is an excellent choice for a small carpentry project. Featuring a high-capacity magazine, exhaust vent, easy depth-of-drive adjustments, and a removable nose cap for prolonged tool life. 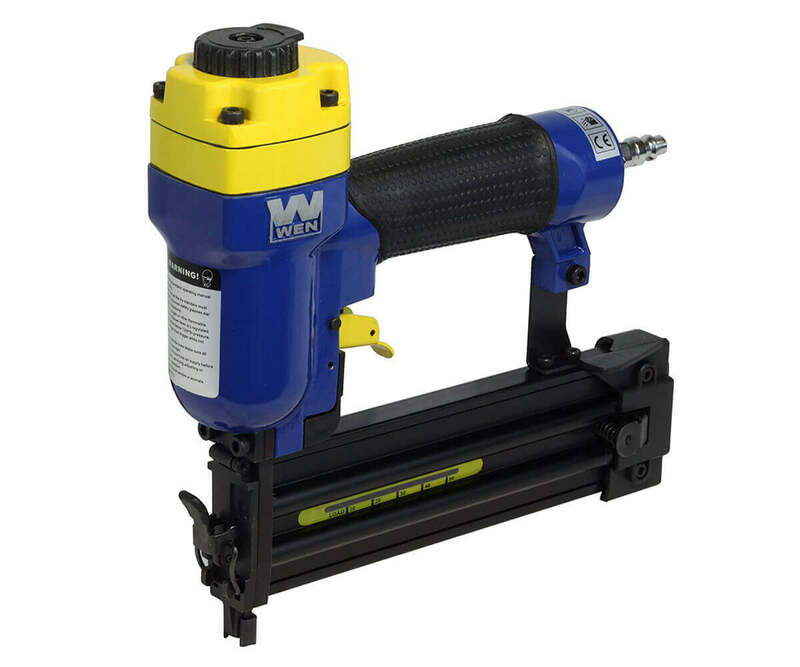 You can handle everything from cabinet installation and picture-frame assembly to furniture construction and finish work with this pneumatic brad nailer. The compact design of Hitachi NT50AE2 brad nailer allows its use in both open and tight space easily. This brad nailer runs pretty well on standard pressure, moreover lightweight body ensures long time use without much physical exhaustion. 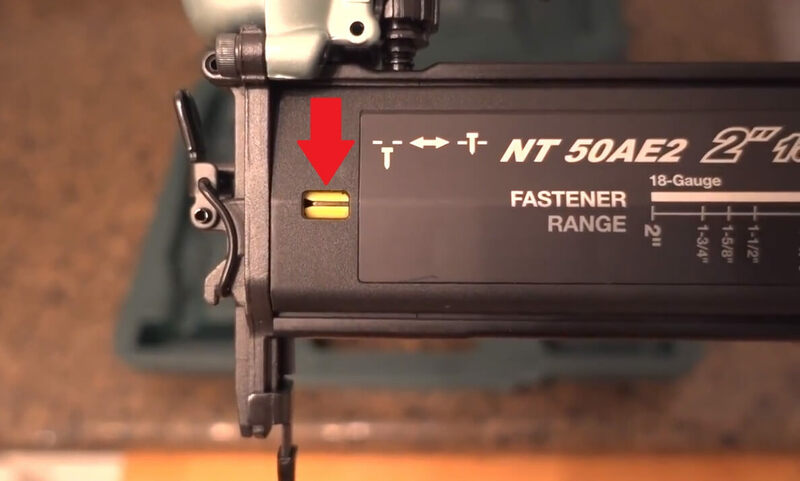 The magazine loading capacity (100 nails) gives the ability to work a long time without reloading for longer timer thus reducing the frequency of unnecessary breaks for reloading the nails. The easily viewable low nail indicator let you know when to refill and greatly reduce dry firing. Compared to other brad nailers Hitachi NT50AE2 is compatible with more nail sizes in terms of length and head sizes. NT50AE2 brad nailer ability to fire 5/8″ to 2″ in nails with head size of 0.075 to 1.9 mm give versatile working power which is unique. Hitachi NT50AE2 do have some minor design flaw and lack of functionality which I honestly believe you should consider before buying. Fixed air inlet will cause problem while working with lighter trim work. Like all other pneumatic nailers, Hitachi NT50AE2 requires oiling before and after usage for smooth operation. Hitachi NT50AE2 brad nailer gives a reliable performance, but we would not say the best. Absence of dry fire lockout and swiveling air intake just prevented itself to gain the top spot. However, incredible value and Hitachi performance offset any lackings plus its price range put it in the right place for DIYer and professionals.